Usually during the championship season there's a few suprises along the way. That was not the case on Saturday. All the expected teams and individuals came out on top in their respective class meets at Ponaganset High, held under ideal autumn-like conditions. La Salle Academy won both the boys' and girls' Class A meets by strong margins. In the boys' competition, La Salle sophomore D.J. Principe took individual honors with the fastest time of the afternoon, a crisp 15 minutes, 50.98 seconds on the Chieftains' five-kilometer trail. The Rams bunched their five scoring runners among the first seven placements to win the team plaque, 21-43, over second-place Bishop Hendricken. Cumberland junior Sean Laverty, who held the lead briefly near the two-mile mark, was a runner-up in the race with a time of 16:00.38. La Salle junior Matt Bouthillette was third in 16:06.22. In the girls' race, La Salle had a 1-2-3 finish from junior Eliza Rego, junior Karina Tavares and senior Sheridan Wilbur to coast to an easy 21-85 decision over runner-up North Kingstown. Cumberland was third with 87 points. Rego was timed in 18:13.71 for her victory. Tavares crossed the line in 18:23.38 and Wilbur finished at 18:30.49. A pair of ninth-graders took the next two positions with South Kingstown freshman Ellie Lawler placing fourth in 18:34.56 and Barrington frosh Grace Connolly finishing fifth at 18:47.75. Another freshman was the first to break the tape in the Class B girls' race with Westerly's Randi Burr nearly 30 seconds ahead of her closest pursuer, winning with a personal-best time of 19:13.06. Bay View sophomore Claire Howlett was second in 19:41.16. With four of its runners finishing among the top 10, Smithfield captured the team prize, defeating second-place Westerly, 42-66. Classical junior Joseph Murphy was a convincing victory in the boys' Class B race. Murphy finished at 16:46.19. Barrington, which won the team title, occupied the next four placements. Senior Gerald Guerrieri led the quartet with his second-place time of 17:11.06. East Greenwich copped both Class C races. Avenger senior Noah Barreto held off Mount St. Charles' sophomore CJ Berg to take the individual boys' title in 16:35.13. Berg crossed the line in 16:41.30. The Avs won, 32-86, over Smithfield. E.G. senior Margaret McCaffrey outlasted Narragansett junior Marissa McPhillips in the girls' race. She was timed in 19:33.45, while McCaffrey recorded a time of 19:38.47. The Lady Avengers were a 46-64 winner over second-place Burrillville. The Broncos' Betsy Dumais was third overall at 20:17.49. 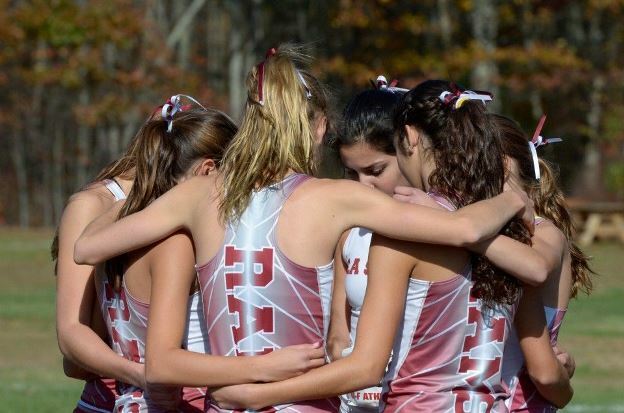 Coming soon, MileSplit RI will have photos, videos and more stories on the meet.